The Violin Shop: Hot Enough For Ya? The Life of Stephane Grappelli and "Hot Jazz"
Stephane was born Stefano Grappelli in Paris of a French woman and an Italian man. His mother died when he was 4, so Stefano stayed with his father until the Great War (World War I). His father, Ernesto Grappelli, was still an Italian citizen, so he was drafted to fight for the Italians. With no family to leave his son with, papa Grappelli left Stefano (the Italian name he was born with) with the famous dancer Isadora Duncan, whom he had worked with, at her school of dance. It was through Duncan that Grappelli received his appreciation for French Impressionist music. Soon, though, Duncan was forced to evacuate her school so it could be made into a military hospital, and Grappelli was left in an orphanage until his father returned from war. The orphanage was a horrible experience for Stefano; he often had to eat flies and fight for crusts of bread to keep from starving! 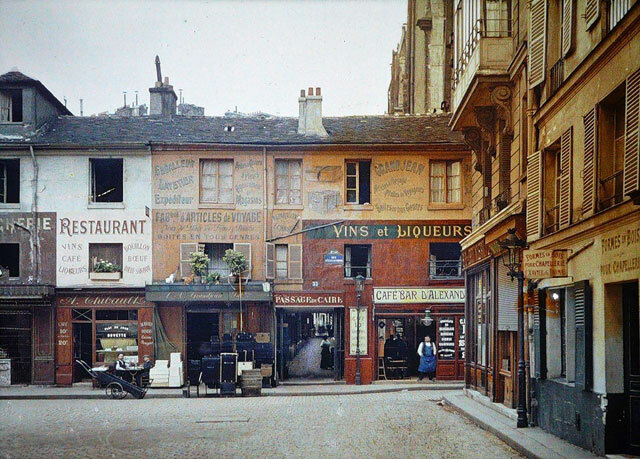 After his father returned from the Great War, Stefano went to live with him in Paris. Ernesto was sickened by Italy after his time serving during the war, so he had little Stefano nationalized as a Frenchman. This is when the name Stefano changed to Stephane, the jazziest of French names! Stephane's father would often take him to free concerts, and he brought home music books from the library for him. Soon, Ernesto pawned his best suit to buy Stephane a 3/4 violin from the local Italian shoemaker. 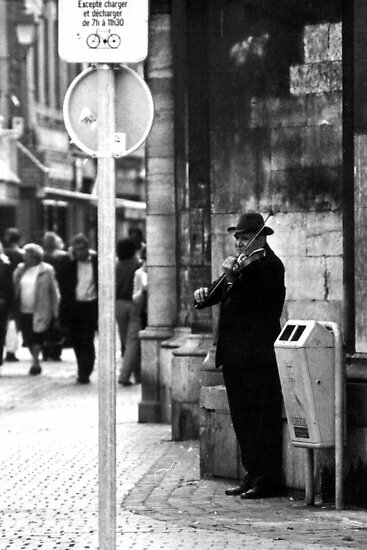 Stephane was about 12, and he preferred to learn by watching other violinists in the street. He was quick and confident. About a year later, he enrolled in the Paris Conservatoire for ear-training, theory, and Solfeggio and studied for three years before going out on his own (his dad had met a lady that Stephane didn't particularly like, and they moved out without him). At age 15, Stephane was busking to support himself. A little later, Stephane was invited to accompany silent films in the pit orchestra, where he worked for about two years playing 6 hour shifts daily. On break, he'd visit a brasserie and listen to an American jukebox they had, which began his love for jazz violin. Trumpeter Louis Armstrong, guitarist Eddie Lang, and especially violinist Joe Venuti (whom he saw live at that same brasserie) were all big influences on him as he learned and played jazz where ever he could. Throughout the 20s, however, most of his gigs were on piano. He regularly played keys with a little known band called Gregor and his Gregorians. 1931 was an important year for Stephane Grappelli. He had a gig at Le Croix du Sud, in Montparnasse, with the Gregors, and Gypsy Jazz guitarist Django Reinhardt was in the audience. If you don't know much about Django Reinhardt, what you should know is that he was a guitar wizard, and he came up with the "hot jazz" guitar technique after a fire permanently injured his left pinky and ring finger - He'd solo using only his index and middle fingers. Django was a big deal, and after the show, Django went up and asked Grappelli if he wanted to play in a group with him. This was the beginning Quintet of the Hot Club of France. 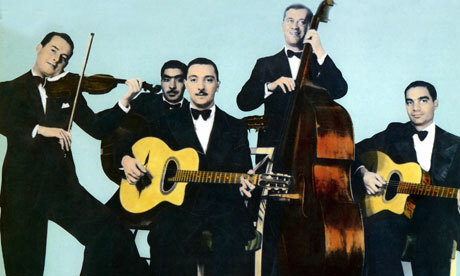 The Quintet of the Hot Club of France was made up of Stephane Grappelli on violin, Django Reinhardt on guitar, Joseph Reinhardt (Django's brother) and Roger Chaput on rhythm guitar, and Louis Vola on bass. The group started with jam sessions between sets at the Hotel Claridge in Paris where Stephane, Django, Roger and Louis were playing in a dance band at the time. On a special day in 1934, the concert promoters of the Hot Club of France, Pierre Nourry and Charles Delaunay (dedicated to jazz appreciation), encouraged the guys to form a full-time ensemble. After Django's brother Joseph joined, the quintet became The Quintet. That's when "Grappelly" (he changed his stage name for a while so announcers couldn't mess it up) entered the jazz mainstream. The Quintet stuck around until 1948, but Reinhardt and Grappelly played together until 1950. Stephane soon started getting gigs with all of the top jazz musicians. Throughout the rest of his life he recorded with the likes of Duke Ellington, Oscar Peterson, Stuff Smith, Gary Burton, Yo Yo Ma, and Pink Floyd. He also played on a few very nice violins; one made by Nicola Gagliano in 1742, as well as a Montagnana and a Cappa. He also had a violin made for him by arch-top guitar maker Robert Benedetto. At 85, just a few years before his death, Stephane Grappelli was asked if he was thinking about retiring. 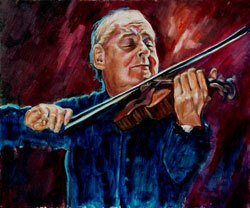 Grappelli responded: "Retirement! There isn't a word that is more painful to my ears. Music keeps me going. It has given me everything. It's my fountain of youth." And music will keep Grappelli going for decades after his death. If you listen to your local jazz station, I can guarantee you will hear Grappelli's influence within a few hours. 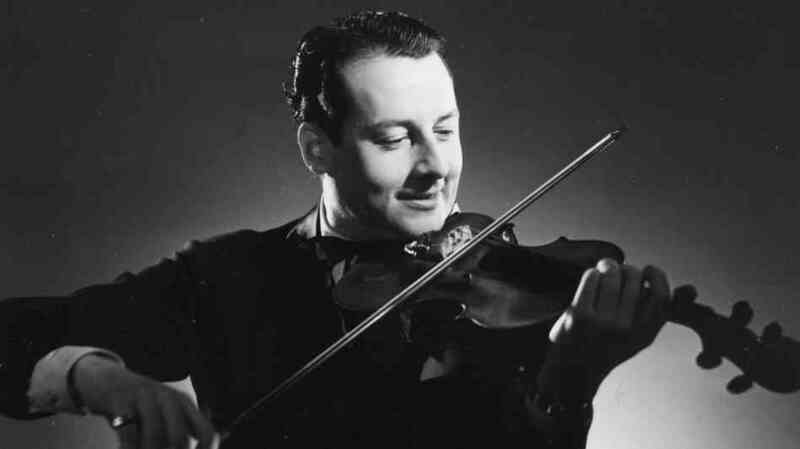 Stephane Grappelli was, and will forever be, one of the greats. Ah, I love this history. Thank you for thinking of, gathering facts/photos, sharing. And great intro... kids & grown-ups starting violin beyond age 9 are sometimes told they've missed the boat. What an soul-bruising LIE!